My youngest daughter, who seems to be my pickiest eater, is showing promise of all things in ethnic foods. Surprisingly, loves sushi but hates mashed potatoes; loves raw mushrooms, but won’t eat asparagus. So, when we surprised her with a trip to have lunch on the set of her favorite television show in LA, I thought here we go — we are going to be in the Mecca of vegan options on every street corner and a fresh pick of fusion cuisine. Luckily, my husband was going with the flow on this “girlie” trip. We managed to partake in some Lip Lab making, a visit to the hip hot spot where make-up influencer James Charles buys his brushes at Morphe, and a stroll down Rodeo Drive. LA was great, but one doesn’t just go sightseeing – for a foodie, it’s all about trying out the local eats. Let’s say my husband got his In & Out burger fix, and I got my food truck carnitas. Yes, I was hoping for a vegan spot, but I was outvoted. Highlights (foodie wise) for us was going to Santa Monica for sushi. Sushi Roku was supremely GOOD. I am always down for a place that makes bento boxes to go. Really, why can’t my Midwestern town support this? Bento Box Drive Thru, stop me if I am wrong, but this would be the BOMB! Again, my daughter surprises me. She is quite amazing. We are blessed with two GREAT girls — spunky, spontaneous and go-getters. Plus, a braggers gonna brag, my little sushi lover also is a soprano and her recent rendition of “O Mio Babbino Caro” qualified her for state! Her singing brings me to tears, momma proud tears. Sorry, I am getting off point. SUSHI. Well, not exactly. We had sushi, BUT again she surprises me with her new found love in Kimchee Cucumber Sunomono. Say what?? Is that a vegetable in there?? Yep, another revelation. Cucumbers are on her list. Look out summer, my garden is going to be exploding with cukes! 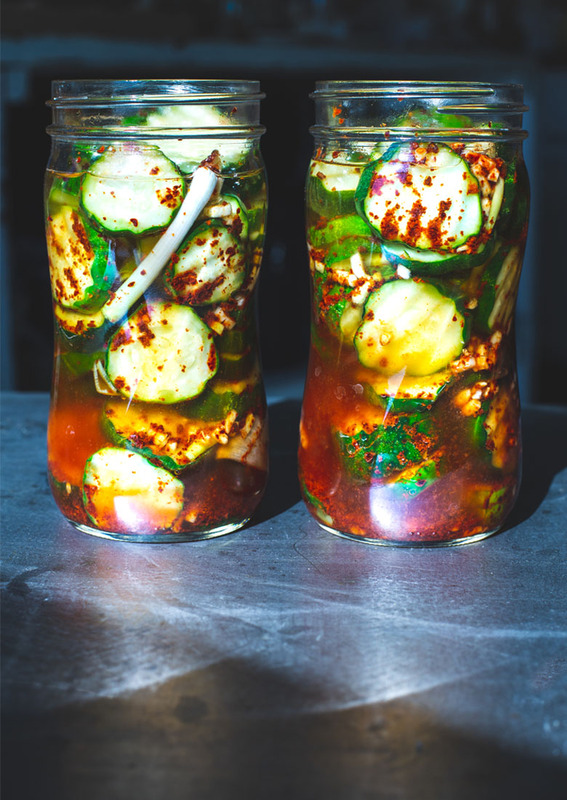 In honor of my songbird, I found none other than the tastiest and closest recipe I could see to Kimchee Cucumbers Sunomono. Thanks to Jeanette, a fellow food blogger who has healthy living down to a science. Check her out; she was awarded the top 50 Whole Food blog. Creds to the best! And a special thanks from my kiddo who is going to love this batch waiting for her in the fridge. 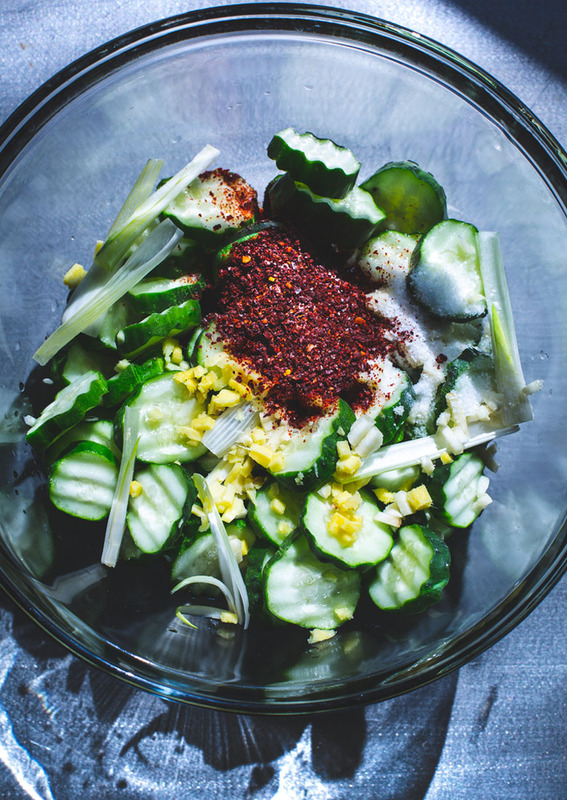 Spicy, crunchy and everything a cucumber could be. Isn’t it cool the things you can make? 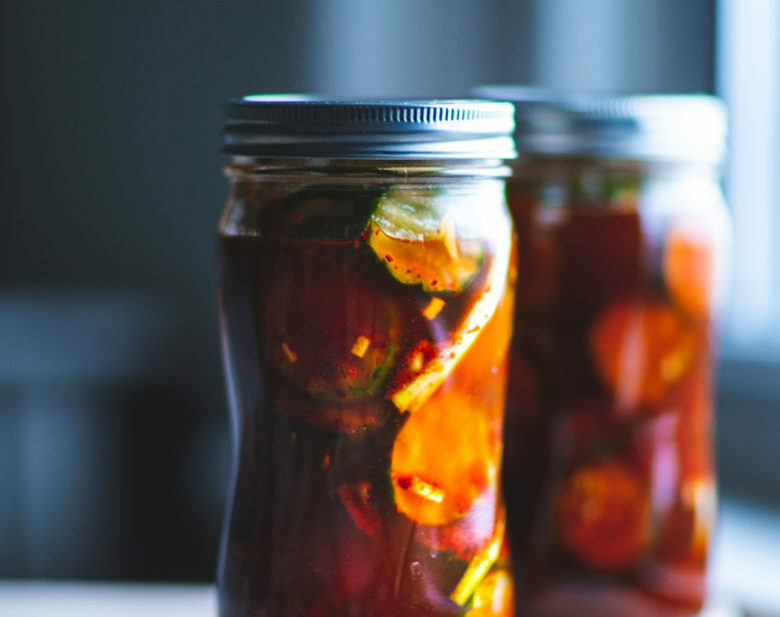 Who wants a boring pickle when your taste buds could be craving these spicy Korean kimchi cukes. 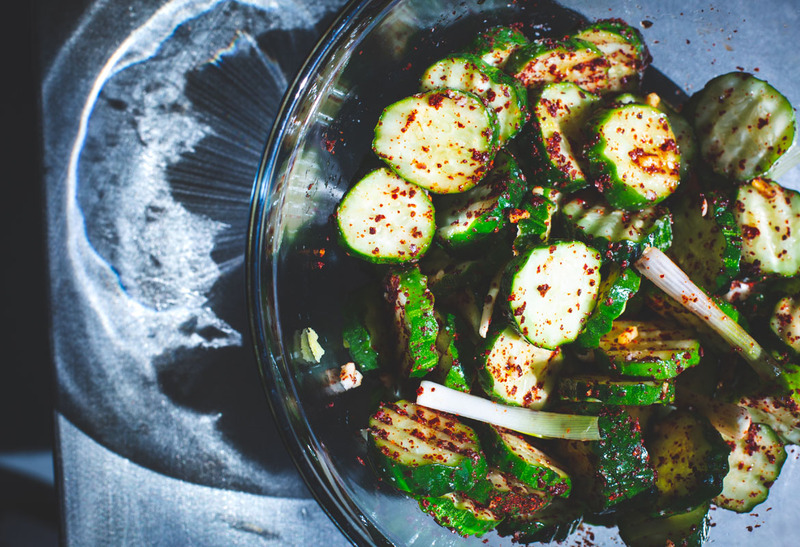 Spicy, crunchy and everything a cucumber could be. Isn’t it cool the things you can make? 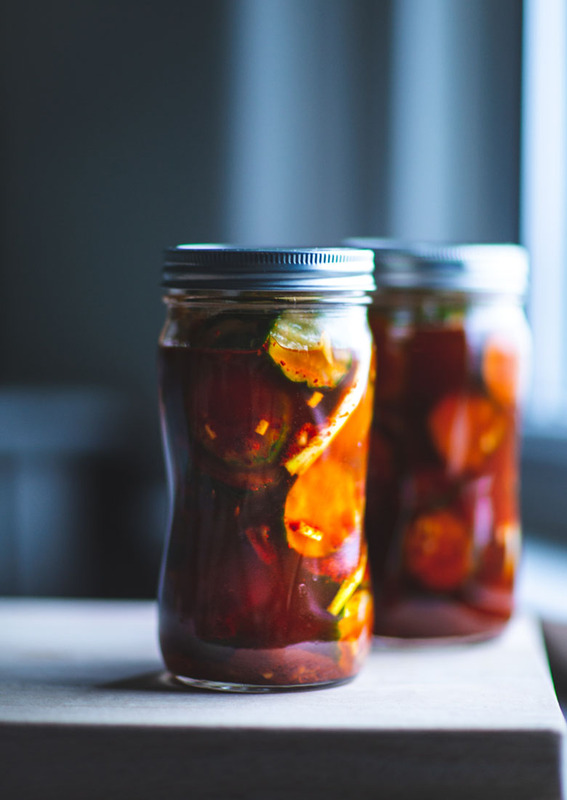 Who wants a boring pickle when your taste buds could be craving these spicy Korean kimchi refrigerated cukes. My addition is a splash of rice vinegar before serving. Probably could incorporate that into the process but, I would need further testing. I want to keep these as close to how it was prepared for us at Sushi Roku. Even though I know, it is not the same recipe but has all the same goodness. Instead of spears, I choose to cut these into moons. I think you are good either way. Go with the flow. Just wash those cukes good. 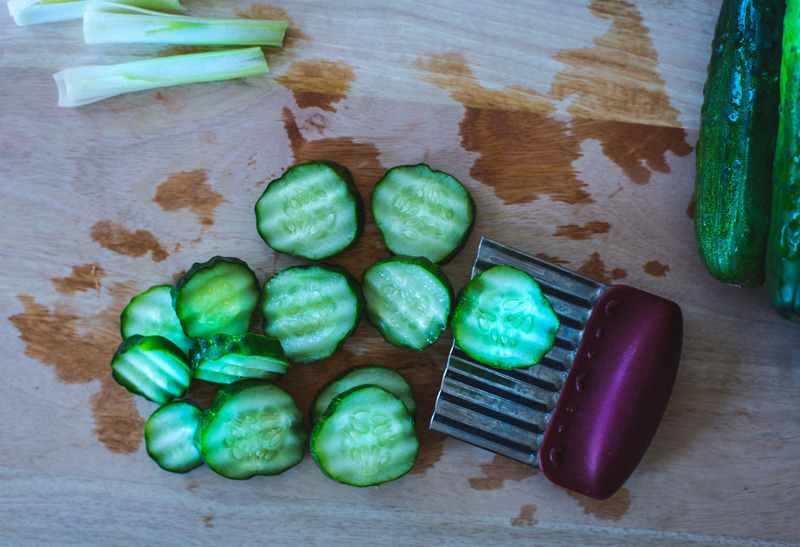 Place cut cukes into a colander. 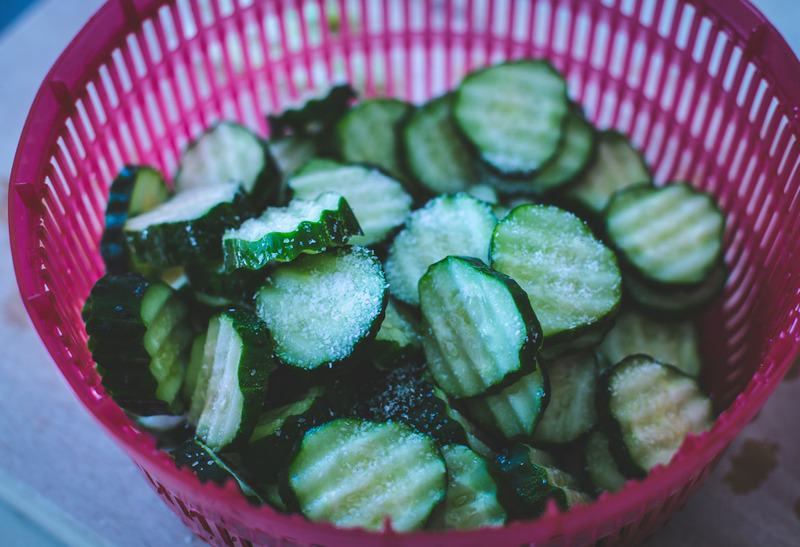 Sprinkle two tablespoons of sea salt on cukes and toss. Let cukes sit for 30 minutes. Place a plate to catch any of the liquid released. Afterward, rinse cukes thoroughly. 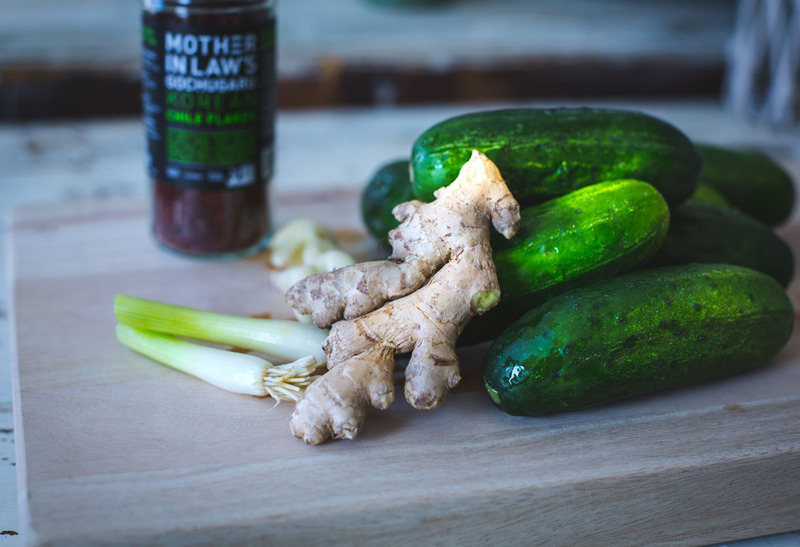 Add the cukes in a large bowl and toss with salt, chili powder, ginger, garlic scallions, and fish sauce. 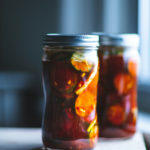 Put into glass mason jars and add water seal with a tight-fitting lid. Now the waiting game, let this sit on the counter in a cool dark place for 24 hours. Halfway, flip the jar over. Make sure that seal is good and tight. Place in refrigerator for the rest of the time while consuming. Serve after a few days. 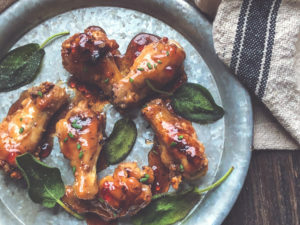 The longer they are in the refrigerator, the more flavorful they will become. To serve, I would suggest a bowl for two to share. Because sharing is caring, and a good splash of rice vinegar for fun. Consume in a week or two. I am sure that it will not be hard to do. Enjoy! 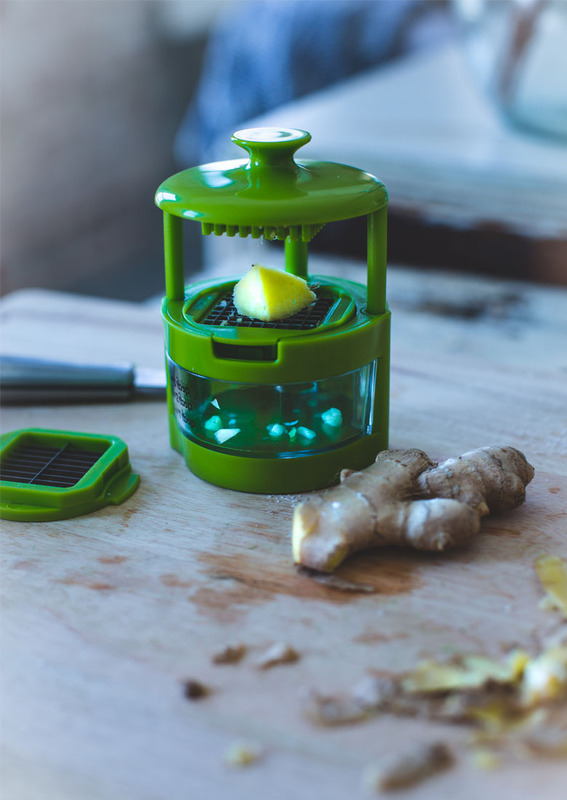 Gizmos and gadgets: Mainstays Chopper from Wal-mart made chopping the ginger and garlic a breeze. I could have used my food processor but I don’t really like doing dishes especially if I am only chopping a couple of tablespoons. The crinkle cutter knife I have had forever. Not sure but I always like my cukes crinkle cut, call me a fancy wanna-be farm girl. That’s the tools, no sponsorship just love what I got!